I've just spent a wonderful weekend in Suffolk. I think it's the first time I've been there. I was helping Charlotte Du Cann of Transition Social Reporters fame to put together a draft version of a new Transition newspaper - by Transitioners, for the rest of the world. Editorially, we're aiming to site it somewhere between Positive News, Permaculture magazine and Occupied Times. Our newspaper is provisionally called Transition Free Press, although the names Transition Times and The Transitioner are favoured by some. As well as trying to decide what to put in the paper, we had a joyous time foraging. I have never seen so many alexanders (wild celery) in my life. The place is rife with them. 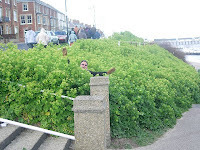 That's me, lost in alexanders at Southwold on the Suffolk coast. They're usually thought to be called alexanders because the Romans brought them over, but Alexander the Great was a Greek king of Macedon who never holidayed in Britain! Makes me wonder if the name actually comes from Alexander's military prowess. He created one of the largest empires in the Ancient World and was undefeated in battle. Much like alexanders in Suffolk, it seems!